Shelby Reed writes lush, sensuous, emotionally involving stories. At the age of ten, she wrote her first romance with Prince Charming  literally!  as the hero, and it's been non-stop story spinning ever since. Jaclyn Reding was born in the Midwest region of the US. 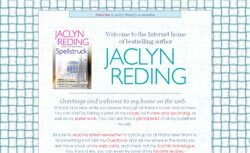 Jaclyn wrote a historical romance novel and published her first novel in 1993. Jaclyn has seen her stories translated into nearly a dozen languages around the world, and no longer needs to work in an office. Okay, perhaps that's stretching the truth a little, but I come from a long line of no-holds-barred storytellers, so I like to exaggerate. Worse yet, I'm a writer, and writers do tend to get carried away. My parents actually owned a dairy farm in Owyhee County, Idaho, near Homedale and I grew up milking cows, breaking ice on the calves' water troughs and checking the bottoms of my shoes before entering the house. While I don't miss the frigid Idaho winters, I do recall those soulful calf eyes with fondness. Nowadays, the only soulful eyes I see are those of my husband when he pokes his head in my office for the tenth time and asks me when I'm going to fix dinner." Have A Favorite Romance Author R? Do you have a favorite Romance Author whose last name begins with "R"? Share it! "R" Romance Authors" Tell us about yourself and your latest Romance Novels!